Families crowded into the Sellwood Playhouse at 901 S.E. 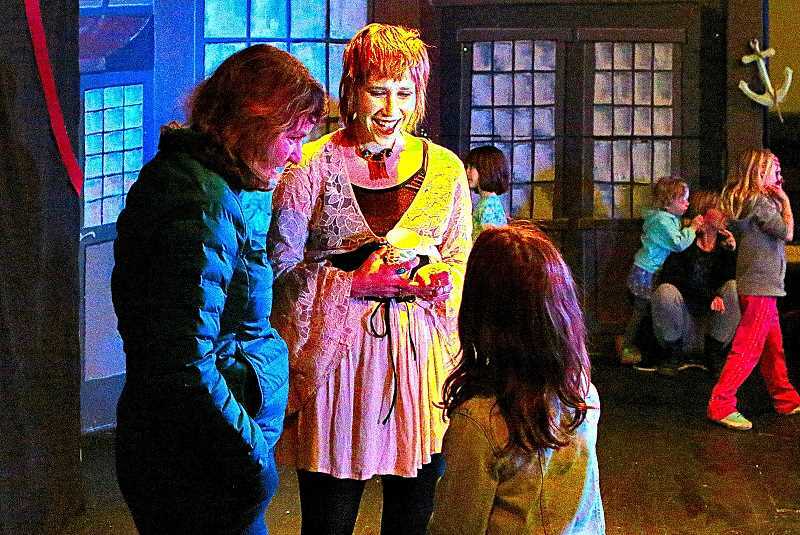 Spokane Street for an afternoon of fun, food, and theater on March 10 – as the nonprofit "Two Wolves Theater School" hosted its first Open House, called a "Sunday Showcase". "After an eight-week session of classes, our kids will offer performances for their parents and community members, on Sunday afternoons," explained the school's artistic and program director, Vanessa Hopkins. During that March Sunday, the school's staffmembers premièred a one-minute snippet of a musical play they're creating about saving the world's oceans, entitled "Nine Fathoms Down". The school teaches theater, music, and dance for young students, Hopkins told THE BEE, while financially supporting the nonprofit "Rogue Pack" organization with which they're affiliated. "We're glad to see families signing up for classes; we're showing that we are a real community of artists, and a part of the community putting a lot of love, and heart in everything we do." Two Wolves Theater School registration for spring term classes continues through first week of April.